We can no longer say that no active male athlete has ever come out of closet. Meet the NBA’s Jason Collins. Hearing the news made me feel like I’d accidentally walked into a wind tunnel. For as long as I had written about this issue and as many times as I had said in recent years that “this will happen in a matter of months if not weeks,” it still hit me like a triple-shot of espresso cut with a teaspoon of Adderall. Thanks to the courage of 34-year-old NBA veteran Jason Collins, we can no longer repeat endlessly that no active male athlete in North America has ever come out of the closet. Instead we’re now able to say that we were there when our most influential cultural citadel of homophobia—the men’s locker room—was forever breached and finally received a rainbow makeover on its unforgiving grey walls. But we didn’t only get the act of coming out. We also got, courtesy of Mr. Collins and Sports Illustrated writer Franz Lidz, about as beautiful a coming-out statement as has ever been put to paper. 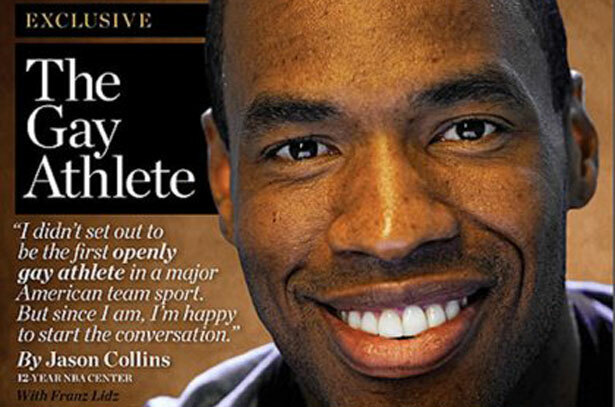 Collins felt compelled to speak out and in the sports world he has considerable company. In the NFL, players like Brendon Ayanbadejo, Chris Kluwe and Scott Fujita have become active and public participants in the movement for full marriage equality and equal rights. We’ve also seen former George Washington University basketball player Kye Allums become the first trans athlete to be public and proud. In just the last two weeks, the National Hockey League adopted an entire program in conjunction with the You Can Play organization aimed at making the locker room a “safe space” for players thinking about coming out of the closet. Then Brittney Griner, arguably the greatest women’s hoops player to ever put on high tops, came out so casually, and it made us all wonder if she was ever actually in. Now we have Jason Collins and in our compressed, fevered media environment, we’ve already gotten a crash course in the probable highs and lows for anyone who wants to follow his path. The highs were seen in an outpouring of support from the sports world. It started immediately with former All-Star Baron Davis who tweeted, “I am so proud of my bro @jasoncollins34 for being real. #FTheHaters”. That opened the floodgates, as numerous players from my boyhood hero Bernard King to the great Kobe Bryant pledged their solidarity and support. Even the Boston Red Sox got into it, inviting Collins to throw out the first pitch at a game. The day also saw that Baron Davis was prescient that “haters” would need to be told to “eff off.” ESPN, perhaps feeling shut out of the biggest story in eons, took the day to give a platform on their crown jewel program Outside the Lines to NBA reporter Chris Broussard so he could opine that Collins was “a sinner” engaged in “an open rebellion to God.” His words were ugly. The fact that he was provided a forum by ESPN to deliver them on this celebratory day was perhaps even worse. But if it was a crude effort by a flatfooted ESPN to make the story about them, then it was a success as social media was then flooded with first anger and then support for Broussard’s “free speech.” Beyond Broussard, fortunately, the backlash was comprised of the typical barrage of twitter trollage. As comprehensive immigration reform saunters forward, advocates across the country are pushing for full LGBT inclusion. Read more at StudentNation.